I hope everybody planned for Halloween Party. My daughter wants to be dressed as Princess, so she is going to be princess. I don’t know about my prince, since he is only 9 month he can’t tell me what he wants? So I can decide what ever costume he can wear. May be I got that privilege for one more year. After 3 he is also going to tell me his decision? I just impose it as good Mom isn’t? I came to know about Halloween tradition only during my stay in Stockholm. In Sweden, I used to see carved pumpkin and lanterns inside the apartment at the windows, at the apartments where I stayed. So that is my knowledge, also it was the time if I turned on the TV I can see almost all kinds of spooky movies. After watching one movie I was so brave enough that I can’t sleep without light on. My hubby wants to watch Paranormal Activity series and he wants company? He is requesting me lot, I am not going to join him unless he change his movie choice. I don’t want to increase my blood pressure. In India there is no Halloween celebration. The spooky movies in India always have a lady singing song with her hair open and walking around in the middle of night in white sari. Her eyes will be red and fire or water can come through it depending upon the situation. When I was kid while watching movie, I will close my eyes when that kind of scenes were shown. Frankly telling now if I watch them they are not at all spooky to me, kind of funny. Yesterday we visited a pumpkin patch in a church. It was really fun, my daughter enjoyed very much, however she was more interested in the play ground than in pumpkin. It was a good drive, both my kids behaved well. We bought four cute little pumpkins. The technique of carving pumpkins has not been mastered by any member of my house. I think it will come as my kids grow. Coming back to recipe since pumpkin is the star ingredient for this month baking partner’s challenge, as this time it is theme: it is cupcakes or muffins. 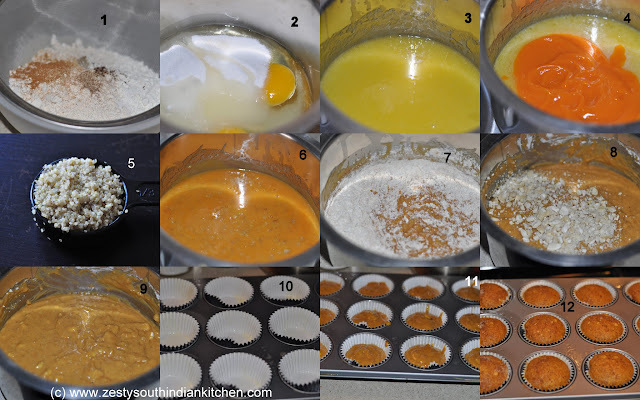 Reshmi of Easy Cook, Priya of Cook Like Priya and Julie of Erivum Puliyumm suggested 3 recipes of muffins and cupcakes. 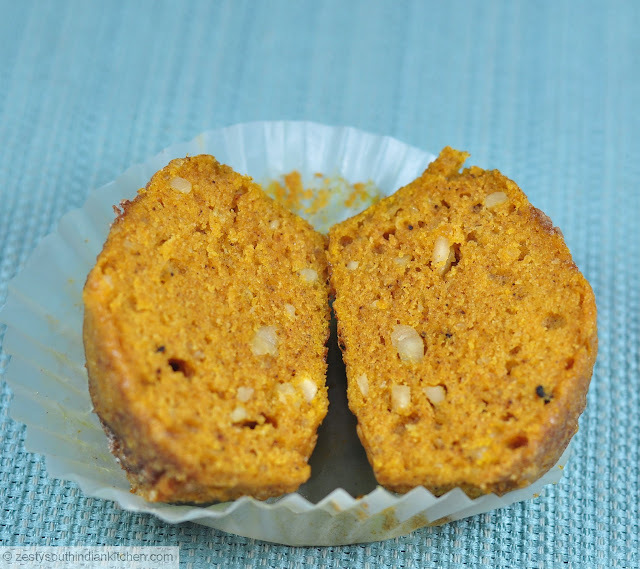 I baked pumpkin muffin suggested by Reshmi of Easy Cook suggested Pumpkin chocolate chips Muffin from Joy of baking. I changed the recipe slightly by adding quinoa and whole wheat flour along with All-purpose flour, but skipped butter and added oil and used homemade pumpkin puree. I also skipped chocolate chips with cashew nuts I tried this recipe twice, first tried with cashew nut and second with cranberries, both version turned out be delicious. Second time I was more health conscious by using only 1 egg, brown sugar and forgot to add baking soda. The result was smaller muffins; this recipe will yield 12 delicious muffins. It was finished within a day. Quinoa the wonder grain adds nuttiness and moistness to the muffin. Take a look at our fellow baking partner’s wonderful creations, they all made delicious muffins or cupcakes depending upon their taste buds, so please visit and discover the taste. You may get wonderful ideas for dessert for your Halloween party. First make pumpkin puree. I made homemade version here is recipe. Then cook the quinoa by washing in the running water and roasting them with little oil for about 6-7 minutes and then cook them with water for about 15 minutes with lid closed. Once it is done set aside. Preheat oven to 350 °F and Line muffin tin with paper cups and grease with cooking spray. In a medium bowl sift, all purpose flour, whole wheat flour, ground cinnamon, ground ginger, ground cloves, all spice, grated nutmeg, crushed cardamom, baking powder and salt. In another bowl lightly beat eggs, sugar, and oil and then adds pumpkin puree and cooked quinoa. Gradually mix in the dry ingredients and finally fold in chopped cashew nut. Transfer batter to prepared muffin pan and bake for about 24 minutes or until tester comes out clean. Enjoy the muffin as much you want. 2 tablespoon turbinado sugar for sprinkling over the top of muffin. 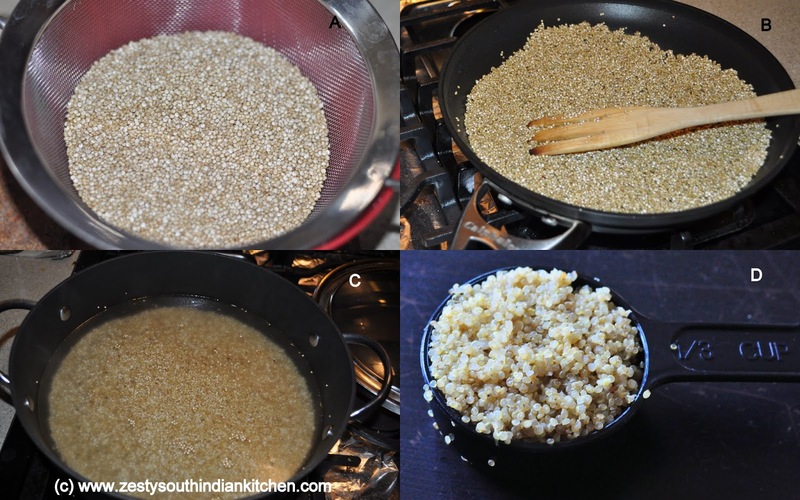 Then cook the quinoa by washing in the running water and roasting them with little oil for about 6-7 minutes and then cook them with water for about 15 minutes with lid closed. Once it is done set aside. Preheat oven to 350 F and Line the muffin tin with paper cups and grease them with cooking spray and set aside. In medium bowl sift both flours, salt, spices, baking soda and baking powder and set aside. In another bowl lightly beat eggs, sugar and oil and then add pumpkin puree and combine everything well. Then add cooked quinoa and mix once again to combine well. To this gradually add dry ingredients and mix well. Finally fold in chopped cashew nuts. 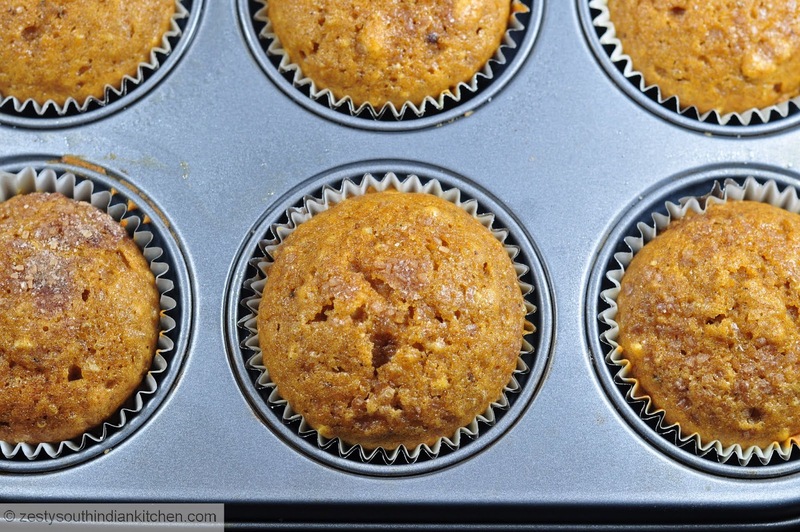 Pour the 2 tablespoon of batter into each prepared muffin tin. Sprinkle the top with turbinado sugar. Make sure batter should only reach ¾ of the paper cup. Bake for about 24 minutes or until tester comes out clean. Once baked leave the muffin in the muffin tin for about 5 minutes and then tilt and remain in the muffin tin for another 5 minutes. Then transfer them to cooling rack. Enjoy as much as you want. Omit cashew nut and try with cranberries. Don’t try to skip baking soda and reduce egg it will result smaller muffin. Adipoli,looks so yummy and moist,love the addition of quinoa and cashew nuts,moist and tempting.. Such delicious healthy muffins and look at the texture..
Quinoa is a very good addition dear,Yummy moist muffins..Lovely!! Omg, you simply made this muffins fantabulously Swathi, i would have never thought of making this muffins with quinoa, well done. Healthy and delicious muffins.. Neat presentation..
Never tasted muffins with quinoa. Love this addition Swathi. Fabulous muffins dear. Looks delicious… Quinoa in muffin is very new to me. Such a healthy version and done so perfectly. Loved your version. 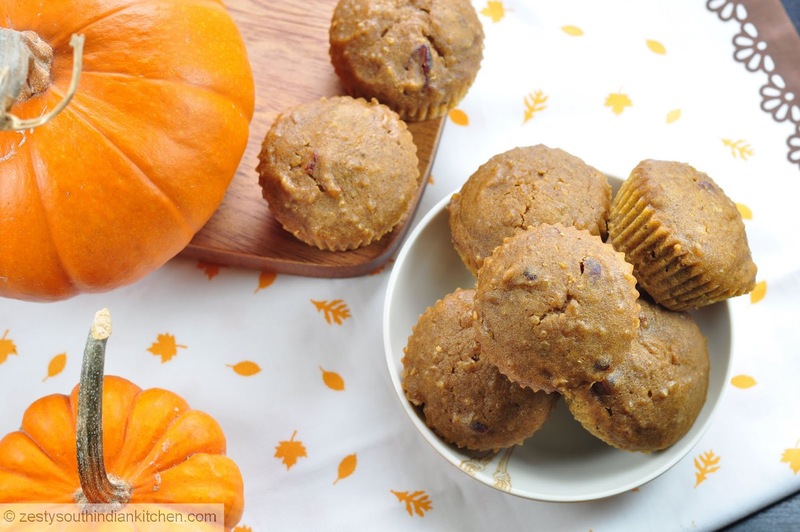 Swathi, you did an absolutely amazing job on these over the top delicious, and healthy pumpkin muffins. You certainly created a brand new recipe from the adaptation of the muffin recipe. Love the addition of the Quinoa, the Cashew nuts, and the fact that you did not add a lot of sugar to it. pinning it to my Pumpkin board! This is the second pumpkin muffin post that I have seen. These looks so lovely. What wonderful muffins Swathi! So unique with the quinoa! I love the cashews too nuts too. How fun to go to the pumpkin patch! I didn’t think they celebrated Halloween in India 🙂 I love that your sweet daughter wants to be a princess…mine always did, too. 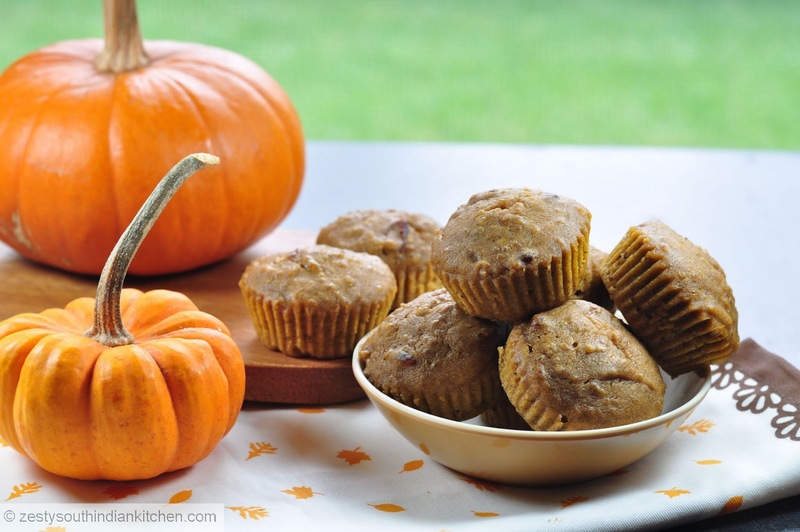 Your muffins look amazing…healthy and delicious! wow..any kind of muffin make me drool….yummy..
Love your healthy version with quinoa and less sugar. I also tried the Joy of Baking’s muffins recipe but made it in a loaf. It really turned out beautiful with spicy aroma and wonderful texture and flavour. Thanx for hosting this event Swathi! These muffins look like something I would want to eat everyday! Great presentation and yummy looking cupcakes! 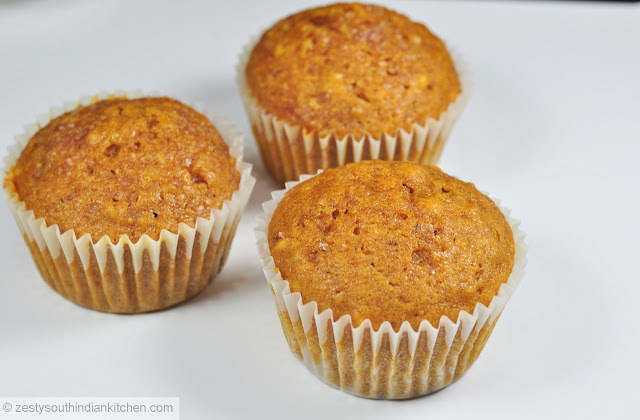 Healthy, lovely, crunchy muffins!!! White saree ghost LOL!! And your story was awesome! I am not into Halloween and even during my growing up years, it was not a big deal for us. Having said that, I love pumpkin any outcome from it, I will drool, including these gorgeous muffins. Great combination! Pumpkin, quinoa and cashew — that sounds so yummy! Good job, Swathi! Exquisito y muy lindo me encanta su calabaza está estupenda ,abrazos y abrazos. Adding quinoa is interesting and you made it more healthier..Love the chunky nuts in between..
A very nice muffin here and another good use of pumpkin. The nuts don’t hurt either. I noticed in your 9.5.2011 blog Rice and Lentil Soup you mention Rose Matta rice. You mentioned diabetes, my spouse suffers that and I want to try it. My question is: You cooked it for a half hour and in a pressure cooker yet. Seems like a really long time; like, longer than standard brown rice. Does it take over an hour at regular stove-top pot cooking? I have pressure cookers, not a problem, it is just that I’ve never seen a rice that required that long a cook time. I assume it tastes good and if it helps with blood sugar reading I will get some when I visit Athens (Georgia, USA)my nearest Indian grocery. Love the quinoa nuts! These turned out beautiful and it sounds like you are certainly ready for Halloween. What a wonderful muffin! I never thought of adding quinoa to pumpkin, but it sounds amazing…and I’d love to add cranberries, too!!! YUMMY! looks yum.if i did not pumpkin i would have thought it had mangoes.